review How much stuff can you cram in an ultrabook before it’s no longer worthy of the name? Ultrabooks are the Next Big Thing in mobility, offering slimline notebooks which rival tablets in terms of portability but still offer the full desktop experience (for better and for worse). The trouble is that it’s very difficult to strike that perfect balance between usability and portability. So far we’re seen plenty of petite ultrabooks such as the Acer Aspire S3 and Samsung Series 9 which put the focus on portability but demand usability sacrifices. Today we’re looking at the 14-inch Samsung Series 5 Ultra 530U4B-S01AU which swings the other way. That’s right, I said 14 inches — even though 13.3 inches is generally considered the sweet spot for slimline notebooks (or perhaps 11.6 inches if it will spend more time on your shoulder than at your fingertips). Along with that extra optical inch, the Series 5 weighs in at 1.8 kg, is 21mm thick and will set you back $1499. Yet somehow this giant still carries the ultrabook name, which requires Intel’s blessing. If you were looking for an ultra-light travel companion, you can probably stop reading at this point. 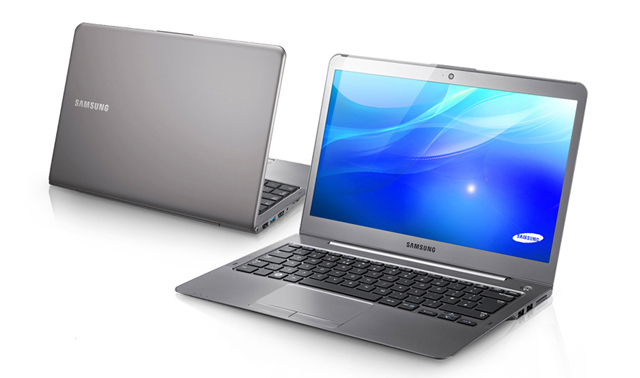 You might consider Samsung’s 13.3-inch model which weighs in at 1.4kg and still costs $1499. But if you’re after a feature-packed notebook that won’t break your back or the bank, stay with me. This so-called 14-inch ultrabook’s most obvious feature is the optical drive, which is usually the first thing to go on an ultrabook. Yes we all cried foul when DVD burners first started disappearing in notebooks, but these days I think road warriors can live without them, considering it’s probably not their only computer. But if the lack of an optical drive has been holding you back, the 14-inch Series 5 Ultra should catch your eye. Turn the ultrabook over in your hands and you’ll find a wealth of connectors including VGA, HDMI, three USB ports, Gigabit Ethernet, headphone/mic jack and a 4-in-1 memory card reader. At this point other ultrabook owners are feeling a little less smug. I particularly like that the third USB 2.0 port is on the right next to the optical drive, as side-by-side USB 3.0 ports may be too close together for you to use both at once. In terms of wireless you’ll find 802.11a/b/g/n (2.4 and 5GHz), Bluetooth 3.0 and the new WiDi video streaming standard. Under the bonnet you’ll find a 1.6GHz Core i5 powerplant along with 4GB of RAM to support 64-bit Windows 7 Home Premium. So it certainly packs more grunt than the entry-level Core i3 ultrabooks. Those hoping for a Solid State Drive will have to be content with a 500GB SATAII hard disk drive accompanied by 16GB of ExpressCache flash memory which helps it boot or wake quickly. Open the lid and you’re presented with a respectable if not super-sharp 1366×768 HD LED display, powered by AMD Radeon HD7550M graphics with 1GB of its own RAM. The screen’s very bright thanks to the LED backlight and thankfully it’s a matte display, rather than those high gloss displays which produce vivid images but offer terrible screen glare. People who work on the run will appreciate the matte display, as they’re becoming less common but make a big difference if you work in varied lighting conditions. You’ll find a 1.3MP webcam in the bezel. Supporting all this is an 8-cell, 45.3 watt battery. You’ll be lucky to squeeze 4 hours out of it during normal use, which is the price you pay for that large, bright screen and the extra grunt. The benefit of the generous screen real estate is the generous keyboard. At this point I should declare my bias. I’m a wordsmith, so to me the keyboard is perhaps the most important feature of a mobile device. Terrible keyboards are generally the reason why I’ve not liked most of the ultrabooks I’ve tested to date. If you don’t spend much time typing then you might think differently, but then I’d also question whether a tablet of some description might better meet your needs. Anyway, the Series 5 Ultra offers a decent-sized keyboard, although the lack of backlighting is disappointing. The keys also feel a little plasticy, but they have a reasonable amount of travel so you don’t feel like you’re bashing away on a solid block. The keys are nicely spaced, if a tad small, but it’s a shame that Samsung has used that extra width to put the Home, Page Up, Page Down and End buttons along the right side next to the Backspace, Enter and Shift keys. It’s easy to hit these buttons by mistake and accidentally jump the cursor around the page. Several notebook keyboard designs use this layout and I guess you might get used to it over time, but I hate it because I spend so much time fixing the problems caused by accidentally hitting these buttons. If your reflex is to hit the top right button for Backspace, but you keep hitting Home, it will annoy the hell out of you until you acclimatise. I wrote this review using the Series 5 Ultra and I was happy to switch back to the keyboard on my 13.3-inch MacBook. Thankfully the notebook’s design also leaves room for a decent trackpad, unlike many ultrabooks. It offers fair-sized left and right-click buttons along with features such as two-finger scrolling thanks to the Elan Smart-Pad drivers. Samsung’s 14-inch Series 5 Ultra crams in a lot for road warriors who don’t want to forgo features and performance. We’d probably be more forgiving if it didn’t bear the ultrabook name. Personally I still think the MacBook Air is the slickest ultrabook I’ve used, and I’d still say that even if it ran Windows. But for Windows users looking for a notebook with a great balance between portability and features, this 14-inch Series 5 Ultra is certainly one to consider. Adam Turner walked away from an old-school newsroom to embrace his inner geek and become a freelance technology journalist. With a passion for mobile gadgets and the digital lounge room, Adam’s on a quest to attain oneness with technology. my ASUS UX31E has a 1600×900 res screen, and there’s no way I’d go to a lower DPI screen on a laptop again! 1366×768 is rather pathetic, and I’d at least want to see a 16:10 screen on the laptop if I had to deal with such low DPI. It looks very nice, but I concur with the others above – the 1366×768 screen resolution is inadequate. I would only be interested in this with higher res screen, and preferably an IPS screen. It would also need a back-lit keyboard for me to buy it. On the plus side, the matte screen, the optical drive and the full sized USB and HDMI connectors. Who wants an ultra book where you have to carry a bag full of (often non-standard) cable adapters around to be able to connect anything? What’s the deal with calling the processor a “powerplant”? It’s strange and distracting. Just trying to add a little colour, gadget reviews can get a little dry and repetitive sometimes. Constructive: I agree with the other commenters, there’s far too few pixels for a screen that big.